This study of the Laptevs, East Siberian, and Chukchi sea shelves concentrates mainly on the specific structure of the sedimentary cover and briefly discusses age and structure of the basement. An elaboration of the tectonic model for the entire Russian eastern Arctic shelf is accompanied by discussions of the existing views on problems which have been hampered by absence of deep offshore wells. The most relevant information was obtained from deep seismic profiling, which provides data on thicknesses and unconformities within the sedimentary cover, tectonic structures, and structure of the basement surface. But without well control the age and nature of the basement and sedimentary cover remain thus far, speculative and will have to be verified by future research activities. 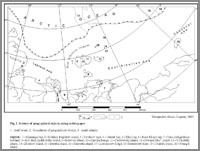 The Laptevs, East Siberian, and Chukchi Sea shelves (Fig. 1) and their transition to deep water basins are still in a very early stage of geological exploration. 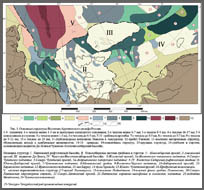 All existing bathymetric, magnetic, gravimetric and geologic data, including shallow wells in the New Siberian Islands area and deep wells in the U.S. sector of the Chukchi Sea shelf, were recently summarized in the process of compiling the State Geological Map of the Russian Federation at a scale of 1:1,000,000. The work was carried out by the Geological Map Division of the All Russian Scientific Research Institute for Geology and Mineral Resources of the Worlds Oceans (VNIIOkeangeologia) during the last 7 years and includes a special geologic map index that unifies the entire offshore area. The level of earth science exploration varies drastically from one area to another, and even in the relatively better studied parts it remains insufficient for unambiguous characterization of geological structure and history, especially in places where subbottom geology is imaged exclusively on the basis of geophysical evidence and cannot be reliably correlated with island outcrops. This paper is based mainly on the State Geological Map at a scale of 1:1,000,000, every sheet of which presents a separate geoinformational system (GIS) layer. All existing bathymetric, magnetic, gravimetric and geologic data, including shallow wells in the New Siberian Islands area and deep wells in the U.S. sector of the Chukchi Sea shelf, were used to construct maps sheets. A set of maps consists of tectonic, deepstructural, bedrock, Quaternary and bottom sediment, and geomorphologic maps. Onshore portions of the digitized database come from geological mapping of the eastern Arctic mainland and islands by the Russian Geological Survey in the middle of the last century. Geological investigations of the offshore area are rather poor. They include bottom sampling, piston cores and rare shallow seismic profiles. Although several shallow boreholes were collected around the New Siberian Islands and exploration wells were drilled on the U.S. Alaska Shelf, the major source of offshore information used in this study is from various geophysical methods of investigations by the Marine Arctic Geological Enterprise (MAGE) of Murmansk (Sekretov, 1998; 1999a; 1999b; 1999c), Laboratory of Regional Geodynamics (LARGE) from Moscow (Drachev et al., 1998), and joint research efforts by the oil company “Sevmorneftegeofizika” of Murmansk and the Geological Institute BGR of Hannover, Germany (Roeser et al., 1995; Hinz et al., 1998; Franke et a.l, 1999), and by the oil company “Dalmorneftegeofizika” of Yuzhno-Sakhalinsk, Russia and Halliburton (USA). Two large provinces are distinguished on the Russian eastern Arctic Shelf. These two provinces in the western Chukchi and East-Siberian seas are generally underlain by basement of either late Mesozoic or Caledonian age. The boundary between these is complex in some areas, with the former overprinting the latter, but can generally be traced from Cape Lisburne in western Alaska, northwest along the northern margin of the Herald Arch to 100-150 km north of Wrangel Island, and on across the East-Siberian Sea to Vil`kistsky Island, southwest of the De-Long Archipelago. These provinces are generally characterized by unique sedimentary cover with distinct stratigraphic ages and are traced using seismic reflection data and borehole sections from northern Alaska and the Chukchi Shelf where American investigators (Grantz et al., 1975; 1982; and 1990 and Thurston and Theiss, 1987) identified two major types of sedimentary cover with good confidence. They divide sedimentary cover into 2 main sequences, the Ellesmerian and Brookian, separated by the regional Lower Cretaceous unconformity (LCU) at the base of the Barremian Stage. Later researchers have distinguished a third sequence in the U.S. Chukchi Sea—the Rift Sequence (Sherwood et al., 2004) which we have not mapped but may be equivalent in part to our J-K1h sequence in Figure 3. This sequence underlies the Brookian and represents the initial stage of opening of the Canada Basin. The second major sequence is the Late Devonian to Early Cretaceous Ellesmerian Sequence, which is generally found in the province with Caledonian basement and had source rocks located to the north in the area of the present day Arctic Ocean. The Early Cretaceous to Cenozoic Brookian Sequence sediments are distributed in both provinces, covering the Ellesmerian Sequence in one, and in the other, covering late Mesozoic folded basement rocks and comprising the whole volume of the sedimentary cover. Ellesmerian Sequence strata can be distinguished on seismic records in the North Chukchi basin, where their thickness reaches 7-8 km, and where the total thickness of the sedimentary cover is no less than 20 km. Grantz et al. (1975 and Grantz et al., 1982) had reported the presence of older, possibly Franklinian or “Eoellesmerian” Sequence in the North Chukchi Basin at the base of the Ellesmerian cover but it is not clear what age they are. We believe his data show lower Ellesmerian Endicott Group strata in some grabens that may be as thick as 7 km, in the North Chukchi Basin. 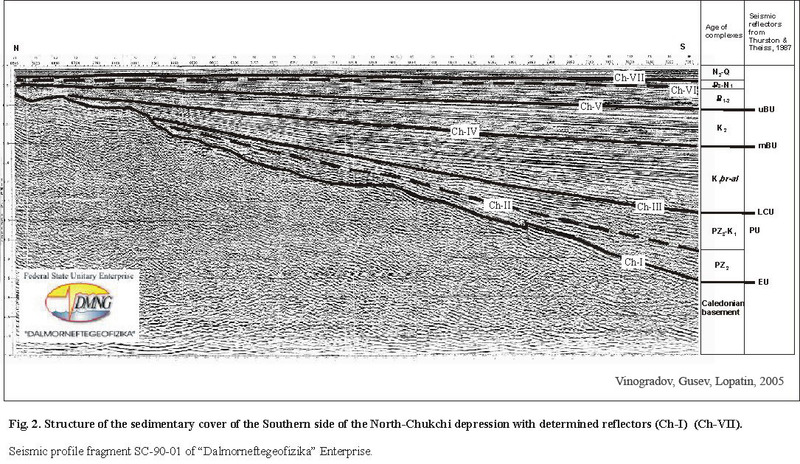 Figure 2 shows our interpretation of a seismic profile collected by “Dalmorneftegeofizika” Enterprise which divides the sedimentary cover of the North Chukchi depression into 7 seismic units separated by reflectors Ch-I-VII, and a correlation to the reflectors mapped by Thurston and Theiss (1987). Older, basal sedimentary cover exists north of the North Chukchi Basin, as evidenced from lower Paleozoic rocks dredged on the continental slope, on the Mendeleev Ridge, and on the steep eastern slope of the Northwind Escarpment, where a continuous stratigraphic section beginning with Cambrian rocks was reported by Grantz et al. (1998). Similar data were obtained by Russian investigators from the southern part of the Mendeleev Ridge, where they dredged moderately lithified carbonateterrigenous rocks exhibiting the occurrence of kaolinitic cement in sandstones, and were paleontologically dated as Upper Silurian to Lower Permian in age (Kaban’kov et al., 2001). 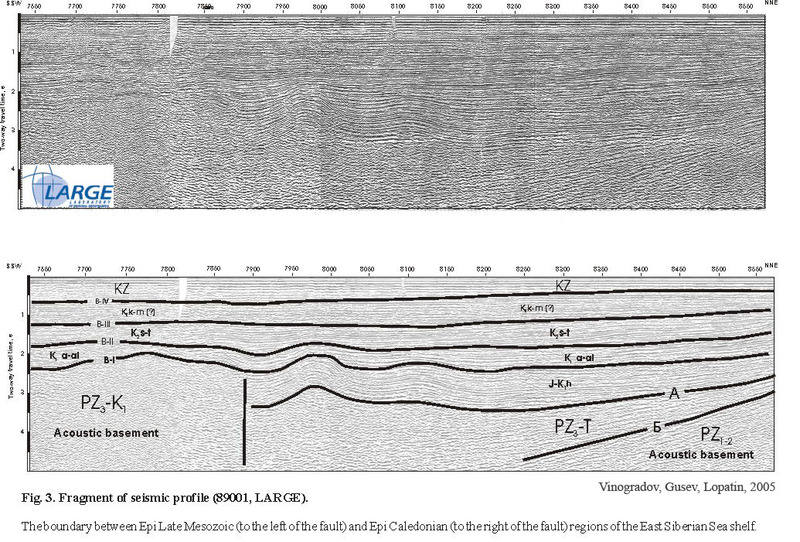 On the East-Siberian shelf, Ellesmerian Sequence strata were recognized on a LARGE seismic profile (Fig. 3) 170 km east-northeast of New Siberian Island (Drachev et al., 2001). Here, two reflectors “A” and “B” are distinguished beneath reflector “B-1” (LCU). The strata between these reflectors thin and are truncated by reflector B-1 to the north (toward the De-Long rise), but to the south, they increase to 7 km in thickness. Besides the increase in thickness, there is an increase in deformation of the strata, which gradually becomes more intense until it is manifested as a rather sharp transition to acoustic basement. We believe this transition of Ellesmerian Sequence to the folded state marks the boundary between late Mesozoic and Caledonian basement provinces. On New Siberian Island, drilling revealed late Mesozoic basement (folded Jurassic terrigenous rocks) beneath Pliocene–Quaternary sediments. Magnetic anomalies over New Siberian Island are similar to the anomalies seen from the cassiterite-bearing granites of Bolshoy Lyahovsky Island. (See Figure 1 Number 8). Placer cassiterite found on New Siberian Island, and grains of molybdenite and sphalerite in the basal Pliocene layers overlying the deformed Jurassic rocks suggest the presence of stanniferous granites in the basement. Caledonian basement is exposed on Henrietta Island (See Figure 1, Number 16) where outcrops of folded volcanic and clastic rocks, bearing sills, dykes, and sheets of basalts, andesite-basalts, and porphyritic diorite occur (Vinogradov et al., 1974). Basalts and porphyritic diorite dated by the potassium–argon method are 310-450 ma and porphyritic diorite dated using the argon–argon method are in the 400-440 ma interval. Fragments of gneissic, granitic, and quartzitic rocks and schists in gritstone of Henrietta Island are evidence that the Caledonian fold basement zones in the De-Long rise province include blocks of older consolidation. More evidence of these older rocks is the presence of flat-lying Cambrian and Ordovician strata on Benetta Island (See Figure 1, Number 15), but these lower Paleozoic rocks cannot be correlated to seismic reflection signatures typical of sedimentary cover on nearby marine profiles. The Ellesmerian Sequence is divided by American authors (Grantz et al., 1975; 1990 and Thurston and Theiss, 1987) into two parts: the Lower Ellesmerian and the Upper Ellesmerian Sequences, separated by a Permian unconformity (PU) at the base of Upper Permian strata. In the wells drilled on the Alaska coast, the highest stratigraphic interval is the Upper Ellesmerian Sequence, and the “PU” reflector marks the acoustic basement. However, in deep depressions where the “PU” horizon separates subparallel reflectors of the Lower and Upper Ellesmerian sequences, it may be lost. This is what we believe happened on the seismic profile in Thurston and Theiss (1987) Plate 5, published before the wells in the Chukchi Sea were drilled. Within the Ellesmerian Sequence below the Lisburne Group, there is a well expressed reflector identified as an unconformity between Endicott Group (D3-C1) and Lisburne Group (C2-3). On the southern slope of De-Long rise, the presence of Lisburne Group rocks is confirmed by dredge samples that contained fragments of siliceous limestone with C2-3 fauna in Neogene volcanics of Zhokhov Island. The Brookian Sequence (Barremian Stage to Cenozoic) is divided by American scientists into Lower Brookian (K1br-al) and Upper Brookian (K2-KZ) sequences. In our interpretation, based on seismic data analysis across the whole eastern Arctic Shelf (from the Laptevs to Chukchi seas), we propose dividing the stratigraphic section into Cretaceous (K1br-K2) and Cenozoic parts. The lower sequence is much thicker and is characterized by numerous plastic and disjunctive deformations as a result of fragmented topography of the basement surface. The upper sequence is a continuous but less thick mantle type deposit. It is seismically transparent and is not disturbed by syndepositional deformations. It has been previously argued that the sedimentary cover of the Laptevs shelf ranged in age from Proterozoic to Cenozoic. However, new multichannel seismic data collected by the Marine Arctic Geological Expedition (MAGE, Murmansk, Russia) and by Regional Geodynamic Laboratory (LARGE, Moscow) reveals that the sedimentary cover on the Laptevs shelf (along Oleneksky Bay and Buor-Khaya Bay; Fig. 1 numbers 4 and 6) is continuous with that of the East Siberian shelf described above (Drachev et al., 1998; Vonogradov and Drachev, 2000; Gusev et al., 2002). It is composed of Cretaceous to Cenozoic strata deposited on folded Early Cretaceous and older rocks. On a seismic profile along the Khatanga Bay (Fig. 1 number 1) there is a sharp change in the character of folding at the Late Mesozoic fold front, which can be traced from the eastern coast of Bolshoi Begichev Island to Tsvetkov Cape (Fig. 1 numbers 2 and 3) on the southern-eastern coast of the Taimyr Peninsula (Vinogradov and Drachev, 2000). Horizontal seismic reflectors, typical for the thick sedimentary cover of the northern flank of the Siberian Platform are sharply terminated at this boundary. On the northeastern end of the seismic profile the reflection character becomes chaotic and looks similar to the acoustic basement along all the profile. Therefore, it appears that the cover sequences of the Siberian Platform do not continue beyond Khatanga Bay in the Laptevs Sea. Rather, the Laptevs Shelf is part of the Mesozoides of Northeastern Russia. There is still a difference between the west and central parts of the Laptevs Sea and its eastern part. In the eastern part the main stage of folding is connected with Early Cretaceous time because coal-bearing molasse rocks of Aptian-Albian age on Kotel`ny Island (Fig. 1 number 9) overly folded Paleozoic and Mesozoic formations with a sharp unconformity. On the central and western part of the Laptevs Shelf, riftogenous processes were superimposed at the final stage of the Early Cretaceous deformation resulting in rather weakly deformed basement rocks being buried under rift formations. The Late Cretaceous sedimentary and stratigraphic history of the Laptevs Shelf is characterized by intense denudation of the area northeast of the Lena River mouth. This is supported by the presence of erosional products in Paleocene strata from granite batholiths emplaced at the end of Early Cretaceous to the beginning of Late Cretaceous in northeast Russia. Further evidence is deep ersional truncation and weathering crust reported in the Tiksi Bay area, where Paleocene sediments, including quartz siltstones, cover the greenshist Verkhoyan suite. Considering the area of uplift (Figure 4-I; and number 6), and assuming a depth of emplacement of granitic intrusives of 3 km or less, a volume of eroded rocks over Northeast Russia during Late Cretaceous time, may be up to 6.5 million km3. On the adjacent shelf, continental slope and deep Eurasian Basin, nearly 7.5 million km3 of sediments were deposited. A quiescent stage set in between the Mesozoic and Cenozoic manifested by Paleocene peneplain facies in the areas of Tiksi Bay, Yano-Indigirskaya lowland, and New Siberian Islands. On seismic records this boundary is expressed by a high contrast reflection representing a regional unconformity between Upper Cretaceous strata. These strata exhibit numerous reflectors that show syndepositional deformation, filling rift grabens, and they are overlain by continuous seismically “transparent” Paleocene strata. In the North Chukchi Basin, Upper Cretaceous strata with widely spread clinoforms attain the importance an independent sequence (Upper Brookian Sequence), separated from Barremian–Albian rocks by a sharp angular unconformity (Thurston and Theiss, 1987, Plate 7). The structure of the sedimentary cover of the eastern Arctic shelf of Russia is generally an assemblage of large basins and rises that separate zones of persistent depressions such as the Laptev basin (Fig. 4, I), New Siberian System of horsts and grabens (Fig. 4, II), Chukchi-East Siberian basin (Fig. 4 IV), De-Long rise (Fig. 4, III), and a series of perioceanic depressions along the Shelf margin (Fig. 4, V). The Laptev Basin (Fig. 4, I) occupies the central and western parts of the Laptevs Sea. It is about 400 km wide at its northern end near the continental slope, and is less than 100 km wide to the south-southeast in the Buor-Khaya Bay area. On the south and west, the Laptev Basin is bounded by mountainous, folded Mesozoides, and on the east by the Lazarev fault that separates the basin from the New Siberian System of horsts and grabens. The internal structure of the Laptev basin is rather complex due to numerous faults, uplifts and troughs. Sedimentary strata reach thicknesses of 10-12 km in troughs and thin to 5-6 km over horsts. The Chukchi-East-Siberian Basin is the largest structural province of the eastern Arctic shelf (Fig. 4, IV). It extends in latitudinal direction over 1300 km, widening from 450 km in the west to 900 km in the east (in the U.S. Chukchi Sea). From the west, the basin is bounded by the New Siberian System of horsts and grabens, from the north by De-Long Rise, from the south by mountainous Mesozoides of North-East Russia. The coastal lowlands are part of the southern flank of the basin. To the east in Alaska, the basin is bounded on the south by the Herald Arch, Lisburne Hills, and Brooks Range and in the north – by the Barrow Arch. The basin can be divided into northern and southern parts based on basement age. The northern province is underlain by Caledonian basement, the southern province by late Mesozoic basement. The provinces are separated by large high–angle faults. In the northern province on northeast Russia shelf, two deep depressions–Zhokhovsky (Fig. 4 number 3) and North-Chukchi (Fig. 4 numbers 5)-are separated approximately along 174 degree west longitude by the Jannetsky transverse uplift (Fig. 4 number 3a). The Zhokhovsky depression extends for 600 km from the east, where it is 200 km wide, to the west where it gradually narrows and disappears in the boundary zone between the New Siberian System of horsts and grabens and De-Long Rise. Upper Paleozoic–Cenozoic strata in the axial zone of the depression reach 10-12 km in thickness. The North-Chukchi Basin within the Russian shelf is also traced for 600 km and its width varies from 250 km on the east to 160 km on the northwest (Fig. 4 number 5). This basin is notable for its great sedimentary thickness. On seismic records, acoustic basement is reliably recognized at the depth of 18 km (Fig. 3). It has an asymmetrical structure with its southern flank dipping steeper than its northern flank. The northern flank and axis of the basin is crossed by the transverse Andrianovsky uplift along the 170º meridian (Fig. 4 number 5a). The uplift has up to 3000 m of relief at the level of the Barremian-Albian strata (LCU), but has practically no expression on the top of the Upper Cretaceous strata (mBU). Twenty to twenty five kilometers north, the axial zone of the North Chukchi basin shifts to younger strata. The North-Chukchi basin is dissected by sublatitudinal and younger submeridional faults. Sublatitudinal faults often bound half grabens on the southern flank of the basin. Submeridional faults offset Upper Cretaceous rocks and bound grabens and horsts, which sea floor expression. In the north, the basin is bounded by the arch-like North Chukchi rise (Fig.4 number 4), which extends west-northwest for 500 km and varies from 50 to 75 km in width. To the northwest, the North Chukchi rise conjugates with the southeastern flank of De-Long rise (Fig. 4, III), and on east-southeast probably with the Barrow Arch. Stratigraphic thickness over the North Chukchi rise is estimated at 6-7 km. The southern part of the Chukchi-East-Siberian basin (Fig. 4, IV) differs from its northern part by the presence of predominantly submeridional structural trends inherited from the late Mesozoic basement. Features with sublatitudinal strike, typical of the northern part, are partly preserved only on the Chukchi Shelf, such as the Herald Arch (Fig. 4 number 14) with thin sedimentary cover and basement projections (Wrangel Island; Fig.1 number 20), and the South Chukchi depression (Fig. 4 number 15) with up to 4-6 km of overlying Cretaceous-Cenozoic strata. Over most of the East-Siberian shelf the structural trend is predominantly submeridional with symmetrical features. The axial zone of the structural assemblage is characterized by the Melvillian graben (Fig. 4 number 8), where Aptian-Cenozoic strata reach 10 km in thickness. This graben structure is actually a zone of extension, flanked by uplifts of the Chukchi and East-Chersky (Fig. 4 numbers 7 and 9), and then flanked again by subsidence features of the South-Denbarsky and Ambarchiksky garbens (Fig. 4 numbers 6 and 10). The basement fault zones, responsible for origin of these structures extend to the north, dissecting Zhokhov depression and De-Long rise. It is very likely that submerged parts of the East-Siberian shelf have riftogenous nature, similar to the Laptev basin. The De-Long rise has a block-like round-to-triangular form (Fig. 4, III), elongated in a west-northwest direction for 800 km. It is 400 km wide in the west and narrows to the east to 150 km. For the most part it is covered by thin (less than 1 km) Cretaceous-Cenozoic mantle type deposits with several projections of Caledonian and probably older basement. On the slopes of De-Long rise the cover is 3-4 km thick, underlain by Mesozoic and Paleozoic strata. The rise is dissected by faults, and bounded grabens and horsts. We draw four main conclusions on the age and structure of the sedimentary cover of the eastern Arctic Shelf of Russia. The structure of the sedimentary cover was formed during two stages that resulted in two structural trends and related tectonic features. The time boundary between these stages lies in Barremian-Aptian. In the older stage sublatitudinal trends predominated, and in younger stage submeridional. Older sublatitudinal zonation was caused by structural features of the basement, whereas younger submeridional zonation appeared as a result of a unique ocean and shelf riftogeneous processes. 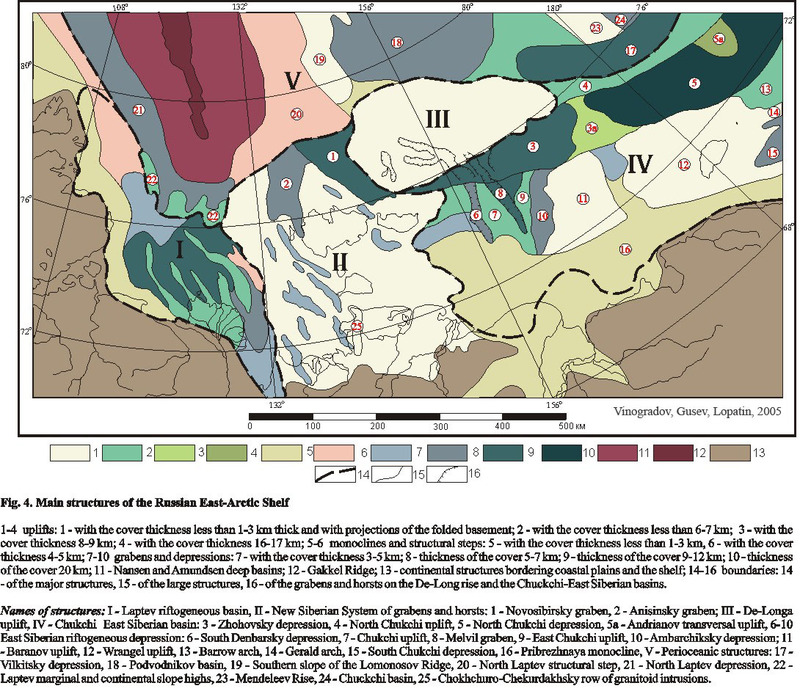 Structural elements of the Arctic Ocean, such as the Eurasian Basin, Lomonosov Ridge, Mendeleev Rise, and Chukchi Basin generally express continuations of the shelf structure in their sedimentary cover. Another important relationship between ocean and shelf is the position of a thick lens of the Lower Brookian Sequence in the North-Chukchi basin just opposite the Chukchi basin in the Arctic Ocean, between Mendeleev Rise and Chukchi Plateau. Active riftogenous processes started simultaneously over all of the eastern Arctic Shelf in the Early Cretaceous and finished by the beginning of the Cenozoic and active tectogenesis migrated in time toward the Arctic Ocean. In the Cenozoic, on the shelf-ocean boundary, perioceanic depressions were formed, whereas on the shelf in a quiescent environment, a thin and continuous sedimentary mantle was deposited. 1. Drachev, S.S., Savostin, L.A., Groshev, V.G. and Bruni, I.E., 1998. Structure and geology of the continental shelf of the Laptev Sea, Eastern Russian Arctic. Tectonophysics, №298, p. 357–393. 2. Drachev, S.S., Elistratov, A.V., and Savostin, L.A., 2001. Structure and Seismostratigraphy of the East Siberian Sea Shelf along the Indigirka Bay-Jannetta Island Seismic Profile. Transactions (Doklady) of the Russian Academy of Sciences/Earth Science Section, 2001, Vol. 377, № 3, March-April, p. 293. (in Russian). 4. Grantz, A., Holmes, M.L., and Kososki, B.A., 1975. Geologic framework of the Alaskan continental terrace in the Chukchi and Beaufort Seas. – In: Canada`s continental margins and offshore petroleum exploration: Canadian Society of Petroleum Geologists Memoir 4, p.669-700. 5. Grantz, A, Dinter, D. A., Hill, E. R., Hunter, R. E., May, S. D., McMullin, R. H., and Phillips, R. L., 1982. Geologic framework, hydrocarbon potential, and environmental conditions for exploration and development of proposed oil and gas lease sale Sale 85 in the central and northern Chukchi Sea: U.S. Geological Survey Open-File Report 82-1053, 84 p., 30 figs. 6. Grantz, A., May, S.D., and Hart, P.E., 1990. Geology of the Arctic Continental Margin of Alaska. - In: The Arctic Ocean Region. The Geology of North America. Volume L. p. 257-288. 7. Grantz, A., Clark, D.L., Phillips, R.L. et al., 1998. Phanerozoic Stratigraphy of Northwind Ridge, Magnetic anomalies in the Canada basis, and the geometry of rifting in the Amerasia basin, Arctic Ocean. Geological Society of America Bulletin, Iuni. v. 110, no.6, pp. 801-820. 8. Gusev, E.A., Zayonchek, A.V., Mennies, M.V., Rekant, P.V., Roudoy, A.S., Rybakov, K.S., and Chernyh, A.A., 2002. The End of the Gakkel Ridge In The Laptev Sea. – In: Geological-geophysical features of the lithosphere of the Arctic Region. St. Petersburg, VNIIOkeangeologia, № 4, p. 40-54 (in Russian). 9. Hinz, K., Delislande, G., Cramer, B., Franke, D., Fieguth, U., Lindemann, F., Neben, S., Tostmann, H. and Zeibig, M., 1997. Cruise report: marine seismic measurements and geoscientific studies on the slope and shelf of the Laptev Sea and East Siberian Sea / Arctic with M.V. «Akademik Lazarev», I.V. «Kapitan Dranitsin», Preliminary scientific results. – BGR-Report, №116.693, 161 p.
10. Kaban’kov, V.Ya., Andreeva, I.A., and Ivanov, V.L., 2001. Dropstones in bottom sediments from Mendeleev Rise (Arctic Ocean), and its significance for geodynamic position. Geology of seas and oceans. XVI Marine School. Abstracts. Vol. 2. Moscow. p. 32-33 (in Russian). 11. Roeser, H.A., Block, M., Hinz, K. and Reichert, C., 1995. Marine Geophysical Investigations in the Laptev Sea and the Western Part of the East Siberian Sea. Berichte zur Polarforschung №176, p. 367-377. 12. Sekretov, S.B., 1998. Petroleum Potential of Laptev Sea Basins: Geological, Tectonic and Geodynamic factors. Polarforschung 68, p. 179-186. 13. Sekretov, S.B., 1999. Eurasian Basin – Laptev Sea Geodynamic System: Tectonic and Structural Evolution. Polarforschung 69, p. 51-54. 14. Sekretov, S.B., 1999. Northwestern Margin of the East Siberian Sea: Structure, Sedimentary Basin Development and Hydrocarbon Possibilities. Polarforschung 69, p. 155-162. 15. Sekretov, S.B., 1999. Southeastern Eurasian Basin Termination: Structure and key episodes of tectonic history. Polarforschung 69, p. 251-257. 16. Sherwood, Kirk W., Peter P. Johnson, James D. Craig, Susan A. Zerwick, Richard T. Lothamer, Dennis K. Thurston, and Sally B. Hurlbert, 2002. Structure and Stratigraphy of the Hanna Trough, U.S. Chukchi Shelf, Alaska in: Miller, E.L., Grantz, A., and Klemperer, S., eds. Tectonic Evolution of the Bering Shelf-Chukchi Sea-Artic Margin and Adjacent Landmasses Geological Society of America Special Paper 360, 8p. 17. Thurston, D.K. and Theiss, L.A., 1987. Geologic report for the Chukchi Sea Planning Area, Alaska. United States Department of the Interior Minerals Management Service. Outer Continental Shelf Report 87-0046, 193 p. Anchorage, Alaska. 18. Vinogradov, V.A., Gaponenko, G.I., and Rusakov, I.M., 1974. Tectonics of East Arctic Shelf of the USSR. NIIGA reports, Vol. 171, Leningrad, NEDRA, 144 p (in Russian). 19. Vinogradov, V.A. and Drachev, S.S., 2000. Tectonic nature of the basement of East Laptev Shelf. Transactions (Doklady) of the Russian Academy of Sciences/Earth Science Section, Vol. 372, № 1, p. 72-74. (in Russian). Vinogradov V.A., Gusev E.A., Lopatin B.G. Structure of the Russian Eastern Arctic Shelf, in R.A. Scott and D.K. Thurston (eds.) 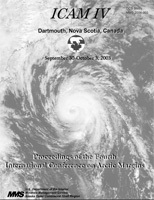 Proceedings of the Fourth International conference on Arctic margins, OCS study MMS 2006-003, U.S. Department of the Interior, 2006, p. 90-98.